A Sunday matinee at the Bob Devaney Sports Center pitted former Big XII rivals Iowa State and Nebraska against one another in a non-conference battle. Sunday afternoon at the Bob Devaney Sports Complex in Lincoln, the #7-ranked Nebraska Huskers Women’s volleyball team hosted their former Big XII rival the Iowa State Cyclones. 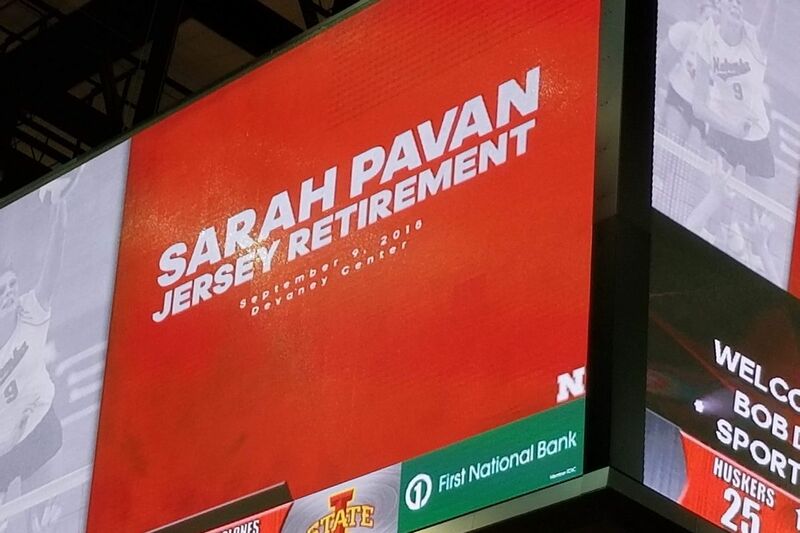 On the day when the Huskers retired Sarah Pavan’s #9 jersey, the Huskers handled the visitors from Ames 3-0 (25-22, 25-18, 25-16). Nebraska scored first, but Iowa State answered quickly to take their own lead, 2-1. Nebraska offense woke up at that point and with junior outside hitter Mikaela Foecke on the service line, the Huskers used a 4-0 to force an Iowa State timeout with the Huskers leading 5-2. The visitors settled in a bit after that, but the Huskers held onto their advantage as the teams traded points. Nebraska head coach John Cook used a challenge early on a ball called in bounds by the official that appeared to touch the line. The call was upheld on review. Two straight Foecke hitting errors closed the score to 8-7 Huskers, and then a kill by the Cyclones tied the score up at eight. Lauren Stivrins hit a slide attack into the block to give the Cyclones the lead again, 9-8. Iowa State served long out of the timeout, tying the score at nine, but it was a couple of exchanges of serve before the Huskers could retake the lead at 12-11. Capri Davis had two consecutive kills to extend the Husker lead to three at 15-12. It was a lead that the Huskers maintained briefly, but the Cyclones chipped away at due to Husker errors. The Cyclones closed to within one, but couldn’t get any closer and with Lauren Stivrins serving, an ace dribbled over the net to extend the Husker lead to three again and force the final Iowa State timeout of the set with the score 19-16 Nebraska. Stivrins’ serve kept the pressure on the visitors and Nebraska opened the lead up to 20-16 before two straight Cyclone points allowed them to close to within two. Iowa State wouldn’t go quietly into the midwestern afternoon, closing to within one at 22-21, but the Huskers earned their first setpoint on a Cyclone hitting error. While Nebraska couldn’t capitalize on that one, a kill from Lauren Stivrins locked up set one 25-22 Huskers. Neither team could establish their offense in the first set. Iowa State hit .100, but bested the Huskers who hit .095. Jazz Sweet and Lauren Stivrins each had three kills for the Huskers and hit .375 and .333 respectively. Capri Davis also added three kills at hit .111. Stats were nearly identical in the first set. Nebraska led in digs (18-17) and kills (12-11), but Iowa State had more blocks (3.5-3). Both teams had three errant serves, but the Huskers had the ace by Stivrins. The Huskers scored first in the second set on a Callie Schwarzenbach kill, but early on neither team could force any separation. Iowa State took the lead for the first time in the set at 4-3. Again neither team could make any headway, and the gap remained the same until a net violation on the Huskers gave Iowa State the 7-5 lead. Nebraska acted quickly to tie the score again at 8-8 and took the lead 9-8 on the strength of a 3-0 powered by Jazz Sweet on the right pin. However, Iowa State then scored two straight to retake the lead 10-9. Another run by the Huskers that featured kills by Sweet and Capri Davis made the score 12-10 Nebraska and resulted in Iowa State’s first timeout of the second set. Foecke continued to serve, forcing an Iowa State attack to sail long out of the timeout, then Foecke got a kill out of the back row and an ace. Another tough serve by the senior outside hitter forced Iowa State’s middle attack to tag the net, adding another Husker point and extending the Nebraska run to 7-0. Iowa State called their second timeout of the set with the score 16-10 Nebraska and then scored on an ugly point to break the Husker run. The Cyclone front row then put down a Husker overpass to make the score 16-12 Huskers and cause Coach John Cook to used his first timeout of the second set. The serve by Iowa State sailed long after the timeout and senior libero Kenzie Maloney aced her first serve to extend the Husker lead back to six at 18-12. Her next serve was a tough serve that led to a Husker opportunity due to an Iowa State free ball. Maloney’s serve continued to be difficult for the Cyclone serve-receive to handle, and the Huskers opened up a 20-12 lead. Receiving errors by the Huskers allowed Iowa State to close the gap late in the set with two straight aces making the score 22-18 Nebraska and forcing the second Husker timeout of the set. The timeout was effective as the Iowa State serve hit the bottom of the net and gave the Huskers the point. The next point saw Brooke Smith on the floor for the first time after being released by the NCAA on Friday. The Huskers scored three straight to take the set 25-18. Jazz Sweet was far and away the best weapon for the Huskers through two sets. She’d notched six kills on fourteen swings with no errors to hit .429. Lauren Stivrins had five kills through the first two sets to hit .333. Nebraska’s offense looked better in the second set, hitting .250 while the defense held Iowa State to .107. The Cyclones continued to outblock the Huskers, holding the advantage 6.5-5, but the Huskers had 29 digs to 25 for the ‘Clones. Jazz Sweet continued to be the question that the Cyclones couldn’t answer in the third set, notching the first three Husker points with kills. Nebraska took a 3-1 lead thanks to Sweet’s offense. A mishit ball by Lauren Stivrins appeared to pull the Cyclones to within a point at 6-5, but the Iowa State block was in the net, which was not called initially and challenged by Coach Cook. The review was short and the call was reversed to make the score 7-4 Huskers. Two more thunderous kills from Foecke pushed the Nebraska advantage to 9-4 and led to the first Iowa State timeout of the third set. Foecke continued to baffle the Iowa State defense with a ball off the defender to make the score 10-4 Huskers. For awhile, it looked like everything was going to fall the Huskers’ way, as balls fell where players were, and the Huskers scrapped their way to a 12-4 lead. Though Iowa State narrowed the gap a couple of times, the Huskers looked much more polished in the third set. Iowa State was forced into their second timeout of the set down ten, 18-8, but the Huskers were getting kills from nearly everyone on the offense. The Nebraska lead ballooned to as much as 11 before Iowa State closed late. The Huskers prevailed in the third 25-16. Only Jazz Sweet had double-digit kills for the Huskers today, but she committed no errors, hitting .500 with 11 kills on 22 swings. Foecke hit .167 with nine kills and Stivrins had eight kills and hit .462. The team hit .257 for the match. The Huskers had an outstanding defensive performance, While they lost the battle at the net, with Iowa State having six and a half blocks and the Huskers scoring six, they Huskers backcourt more than answered the call. Of the 48 Husker digs, Kenzie Maloney had 14 and Nicklin Hames had 13. Iowa State had 43 digs. Iowa State has a lot of weapons, including one of the best liberos in the country. The fact that the Husker offense, Sweet in particular, found ways to silence the defense throughout the day is a good sign for conference play. Next weekend the Devaney Center will play host to the Husker Invite. Missouri State, New Mexico, and Central Michigan come to Lincoln for two days of volleyball. The Huskers play both Central Michigan and New Mexico on Friday with the Central Michigan match at noon and the New Mexico match at 7:30 Central. The Huskers take on Missouri State at 7:00 Central Saturday evening. 2019 NFL Draft Profile: Wide Receiver Stanley Morgan Morgan holds all the major Nebraska career receiving records. Where will he fit at the next level? Frosted Flakes: Big Ten Baseball Standings It’s going to be a very interesting ending to the conference season. 2019 NFL Draft Profile: LB Luke Gifford After a solid college career, will homegrown Husker Luke Gifford hear his name called this weekend? 2019 NFL Draft Profile: Running Back Devine Ozigbo After a breakout senior year will the Husker fan favorite be selected in the draft?